Duquesne University students wait to cast their votes in Pittsburgh during the 2016 Election. The path toward doing so won’t be straightforward, as the range of machines on display suggested. You don’t even need to color in the entire oval on the ballot, he said. The ballots are then scanned into a device which, like many others, looks like a fax machine grafted to a garbage can where ballots are stored. Russ Dawson of Electec Election Services, talks with poll workers in Erie. The state’s election commissioner, Jonathan Marks, said that statewide, the new machines will cost at least $100 million. Even coming up with half of that money won’t be easy, says Douglas Hill, who heads an organization that represents county leaders across the state. They’ve got a long way to go. Wolf has about $15 million in federal money on hand, and the 2019-2020 budget proposal he offered earlier this week requests $15 million more for the upgrades. But there are no guarantees he’ll get that money. State Republican Party Chairman Val DiGiorgio seemed unimpressed by Wolf’s pitch. Allegheny County, for one, spent months training poll workers and others the last time it bought machines for its 1,300 polling places. County spokeswoman Amie Downs says officials know they’re up against a deadline, but they don’t know when they’ll make a purchase. Few election officials want to unveil a new voting system in a presidential year, when turnout – and scrutiny – are greatest. But some fear they have little choice. 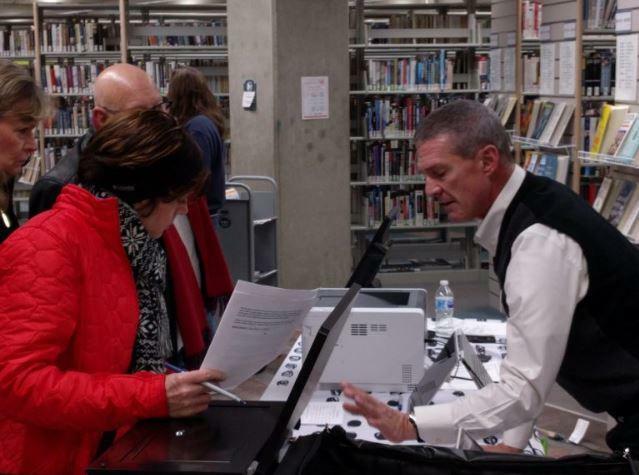 Unlike Erie, Allegheny County hasn’t hosted its own open-house on voting machines. Downs says the state is still approving some machines for county use, and officials want voters to have a chance to see them all. Activists, many of whom were dubious about counties’ decisions to buy paperless systems in the first place, also fear the influence of vendors. Butler and others at the Erie event got to vote in a survey of their favorite system. County officials haven’t yet determined a winner. But whatever the outcome, there will be a paper trail.